Why should you choose a board on board fence for your property? 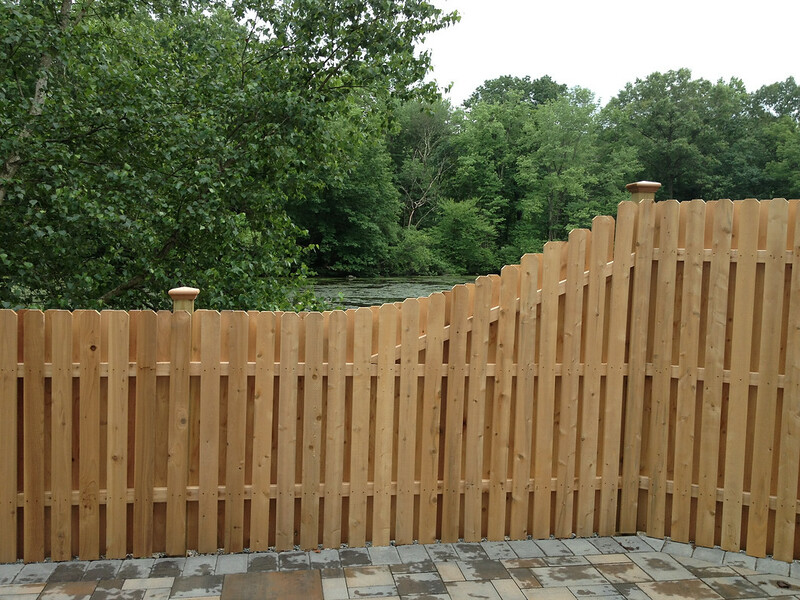 A board on board fence offers a homeowner privacy, versatility, and functionality. 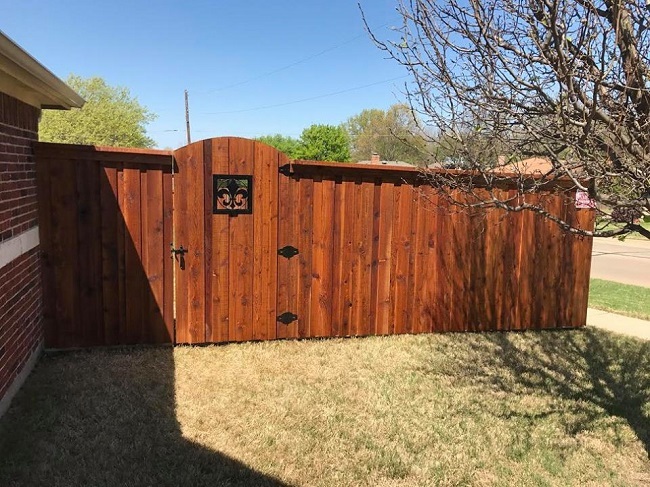 This fencing style is available in several different designs and because the boards used in construction are wooden, they can be stained to match any color scheme. If you’re concerned about security, look no further than a board on board fence. While the ‘shadow box’ design of the fence does allow some light through the slats, this space isn’t generally enough for a pet or small child to slip through. If this is still a concern, then you can simply choose a fence design that is slightly tighter and eliminate the risk altogether. Board on board fencing is a great choice for homeowners looking for a strong and durable fence that will last for years after installation. Generally, the posts are dug deeper and the boards are longer than those in an average fence. This combined with the connected design of the finished fence makes for a solid, lasting structure. 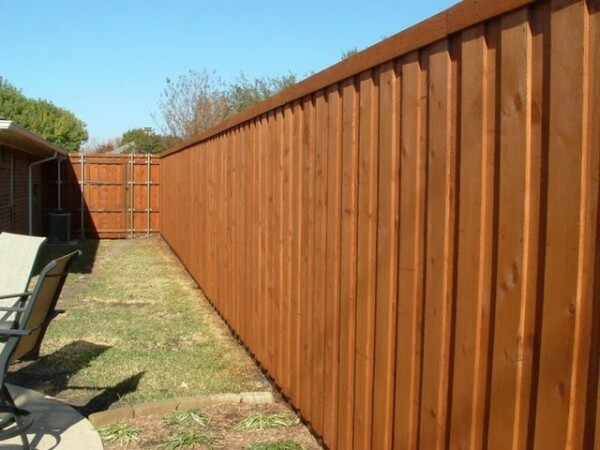 Homeowners have the option of staining or painting a board on board fence any color they choose, which not only helps protect the fence but also helps unify the aesthetic of the space. Is a board on board fence the right choice for your home? Contact us at Philip’s Fences today to discuss your options and get started on a fence you’ll love for years to come. Installing a fence around your property or front yard? Consider getting one on your driveway as well. Here are a few benefits of driveway gates. A driveway gate will stop unwanted people from driving on your property and driveway. In addition, its presence alone will ward off potential burglars. Burglars look for easy targets. When they see a house with strong security protections, they’ll likely skip it. 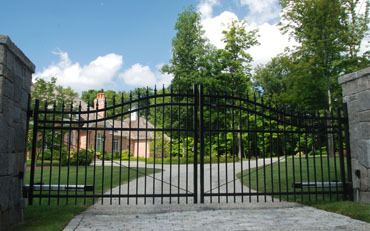 Driveway gates will also give you more privacy by keeping away solicitors and salespeople. A driveway gate will protect your kids from predators. However, they don’t just keep people from coming in; they also keep people from going out. If you have very young kids, installing a driveway gate will keep them from going out on the road. This is especially useful if they often play and bike in your driveway. It will also prevent your pets from wandering away. A driveway gate will improve the overall curb appeal of your home. This will cause your property value to increase. If you ever end up selling or renting your home, you’ll thank yourself for installing a driveway gate. It’s best to get a driveway gate which can be controlled remotely. This way, you won’t have to get out of your car every time you drive in or out of your driveway. It will also keep your property more secure; you can install an intercom and a camera system by your gate so you can see who is going in and out. Contact us for more information. Clear Natural Wood with White Cedar and Oil Sealant—The look of natural wood is an attractive addition to any landscaping design. If you want the look of raw, unfinished lumber, white cedar is ideal because it is a natural light tan color. When sealing the fence, use a clear oil-based sealant that will only make the fence slightly darker when applied. Over time, the fence may become discolored, which can be fixed by carefully pressure washing it and applying a new coat of oil-based sealant every few years. Unconventional Colors Over Red or White Cedar for Modern Designs—Often, homeowners want more trendy, modern designs. Using unconventional stains like black and other colors will give your fence a unique look. If you want to have a stain that is a mix of dark and light colors, use white cedar, which when stained will allow lighter wood grains to show through the stain. For darker colors and reddish tones, red cedar will take stains better. Conventional Stains with Red Cedar—The most commonly used cedar stains are red tones, which are used with red cedar. Red cedar is popular because of its natural reddish wood grains, which takes red stains well. If you want the wood to have deep red tones, red cedar is a great choice of materials. For lighter reddish color, use clear sealants and leave the wood to age to darker color naturally. 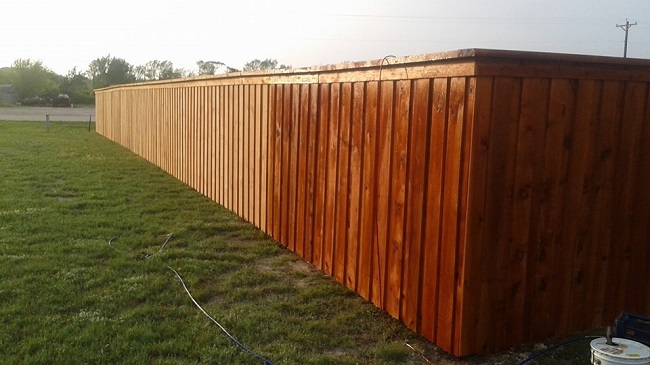 These are some of the different choices that you will want to consider for a cedar fence with a custom finish. 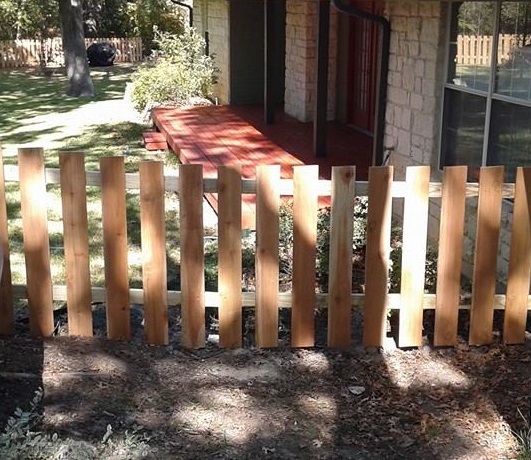 If you are ready to have a new cedar fence installed for your home, contact us to get the new fence you want. In Texas, a house with a white picket fence is an iconic image representing home and family. It is traditional Americana at its finest. Nevertheless, every few years or so, it will need repainting, which can sometimes become a tedious chore. Short of pulling off Tom Sawyer’s trick of enlisting friends to complete the task, painting an old picket fence can be very laborious. However, there are ways to make things run more smoothly and bypass the frustration some people may feel. Today’s tips should provide you with some help. 1. Cleaning – Before attempting to paint an old picket fence, scrape off any peeling and old paint. Additionally, using a drop cloth will make cleanup easier. Once done, cover your plants with plastic sheeting and use a power washer to blast off any remaining paint and get down to the bare wood. 2. Preservation – All wood fencing is susceptible to the weather. So, before painting, you will need to apply a wood preservative that will resist water. While you may be tempted to use a sprayer, it is best to do this by hand. You want to make sure you get every nook and cranny. 3. Primer – A single thick coat of primer is all you should really need. Most of this can be accomplished using a paint sprayer, but use a brush to get at the hard to reach areas. A gallon should cover roughly 400 square feet. Also, much sure you cover your plants. 4. Painting – Don’t expect to get perfect coverage with just one coat. Two thin coats will produce a better result than attempting a single thick coat. Make sure to give your first pass enough time to dry before applying a second. Again, you can use a sprayer but make sure you have a brush for tricky spots. 5. 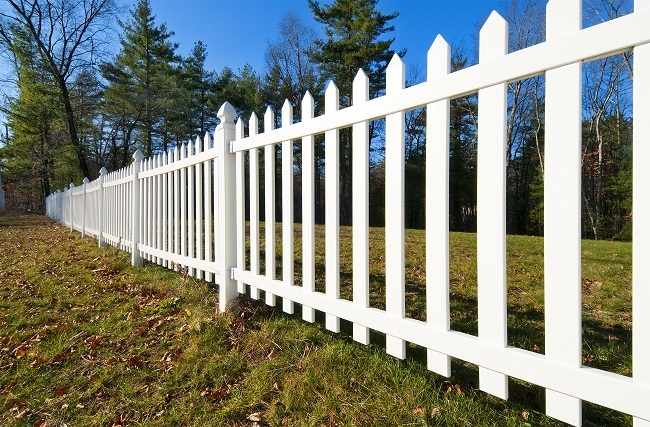 New Picket Fences – It is always better to paint a new picket fence before installing. Not only will it be easy to get it painted, the wood in the ground is better protected. Do you have any questions? What haven’t we covered yet that is important to you? If you would like to talk about the best way to paint an old picket fence or a related topic, please contact us. Vertical gardens are a great way to add a personal touch to fencing and other areas of your landscaping. If you have a wood fence, you can build your own planters and fasten them to the fence with screws in any pattern you want. To fasten wood planters to a chain link or other metal fence, drill holes in the back of planters and fasten them with metal wire. Make sure you use enough wire to support the weight of planters. Bench seating is an invaluable addition to outdoor space. It seems that there are never enough seats when you have a crowd over for a cookout. Create wood bench seats to provide more seating to the landscaping around your home. Use wood materials that are the same as the material used to build your fence or features like outdoor privacy screens. The benches can even be built into wood fencing, which will help add strength to both the fence and the new bench. You can also build some planters to match your new benches. 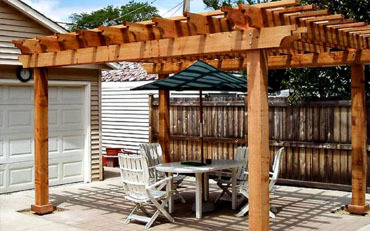 Pergolas and arbors are another great options if your yard gets a lot of suns and you need some shade relief. There are kits available, as well as wood fencing materials that can be used to build new arbors and pergolas to add attractive accents to your landscaping. Use arbors for entrances at fences to give your home added privacy and pergolas to provide shade for outdoor seating and gathering areas. Pergolas can also have automated canopy installed with them to give you control of shade and sunlight, as well as cover from rainy weather. When the weather is at its best, take advantage of your free time with some of these unique fencing projects. Contact us to get the fencing supplies you need for your weekend warrior projects. If you’re looking for a fence that offers privacy and security at an affordable price, a board on board fence may be just the ticket for you. The term “board on board” describes a fence made of boards nailed (in various configurations) to a post and rail framework. Posts are usually sturdy 4″ x 4″ or 4″ x 6″ wood or metal, making a board on board fence a durable option for homeowners. Many people consider board on board fencing a “neighbor friendly” option since both sides have the same appearance. Because of this double-sided 3-D effect, it’s also frequently dubbed “shadow box” fencing. The price of a board on board fence is flexible depending on the type of wood used, and the desired height (generally 4″, 5″ or 6″ high). Many people choose red cedar because of its natural appearance and its innate resistance to both insects and the elements. Add a clear weather-proofing treatment and your cedar board on board fence can last for decades. Matching or coordinating gates can easily be added to your board on board fence where necessary, and you can dress it up or down through your choice of hardware. Fence tops can be concave, convex or straight and the style of a board on board fence can be customized by varying board widths and heights. To corral kids and pets, choose a 4′ high fence. For top quality fences and expert installation in the Ellis County, Texas region contact us today at Philip’s Fences! The gates on your fence have a special visual and psychological meaning. They are the entrance portal to your realm. They are meant to be opened with some ceremony. The gateposts on both sides of the gates themselves are taller than ordinary fence posts so that strangers can locate the access point. Tall gateposts lined by horizontal rail are iconic, symbolic of the threshold. There are often arches or small structures that give the gateway a certain gravitas, making people think about entering. Fence gates have a special physics. In a way, stable gates are an impossibility because the laws of physics conspire against them. Gates will always tend to sag, and when they do they just don’t work right anymore. They pinch against the latch post. The gate misses the latch. The boards that once came together like gears in a well-made clock now seem to repulse each other. A gate will sag if the gatepost shifts or the frame of the gate bends under its own weight. An angled cross brace can confer some stiffness. Without the cross brace, only the corner joints and the fasteners that hold the gate together hold the gate in shape. Over time, of course, tugs on the gate will loosen the nails and scrape the joints reducing the hold of friction. The square becomes a parallelogram. Braces have to be put in the right place to hold the gate structure together. If the brace is installed in the wrong direction, a downward load on the end of the gate will eventually push the vertical frame on the hinge side of the gate sideways, warping the structure. There is always a lot of upward force on the post that has the hinges on it. The downward force on the end of the gate tends to turn it, pulling out the bottom hinge and lifting the fence post itself out of its hole. Loading a gate is like pushing down on a sheet of paper held on its edge. The principles of gate rigidity and the forces and tensions on the gate and the gateposts are true of all materials, even though many materials have better rigidity, inherent strength and less mass than wood. If the gate is made of wood, you have to cope with the shrinking and expanding qualities of wood. Wood tends to shrink against the grain. Shrinkage and expansion of boards can cause nails and screws to pop out of their holes, or boards to split when the fasteners don’t give. The gate is likely to twist from true along its face. Gateposts that hold the hinges have to be strong and well-anchored. There is a lot more downward force on them than the ordinary line fence posts. The anchorage of the gate posts in the earth must be deep enough to prevent the continuously lifted and falling posts from popping out of the ground. In anchoring the gateposts, you have to consider the condition of the soil and the degree that moisture and ice conditions change the soil line. The gate is the only moving part in the fence. As such, it is subject to repeated and constant change that causes stresses, swinging on the gate, slamming the gate. Since fences have to be contiguous, with no breaks, the stresses from the turning forces will translate down the entire fence line, creating pressures that threaten the structure all along the fence. Use rot and corrosion-resistant materials. Build the gate in a way where water is shed away from the fence. Sink posts (especially gate posts) into concrete. Use heavy-duty fasteners and hinges. Make your joints between elements of your fence (especially in the gates and surrounding posts) very strong and stable. Philips Fences is family owned and operated and has been building quality fences in the Ellis Texas area for over 25 years. Please contact us to learn more. Why Install a Garden Fence? A simple semi-private wooden fence and gate beckon visitors to explore this flower garden. A privacy fence creates a “secret garden” atmosphere in a lovely flower garden and lets you escape and enjoy its beauty by yourself. Guests entering the fenced area are introduced to a special “room” in your yard. A traditional “kitchen garden” is a real temptation for deer, fox, badger, and rabbits. A classic white picket fence is an effective and charming deterrent when mounted on top of a low stone wall. If you’ve got a pretty view around or beyond the garden, and don’t want to obscure it, install a fence that has both structure and transparency. Problem solved! Install a wooden fence that’s an interesting and pretty as the garden itself and you’ve created a garden with twice the visual impact! Talk to your local fencing contractor to learn about your options and to get some advice from a professional about which type of fence will work best for your garden. 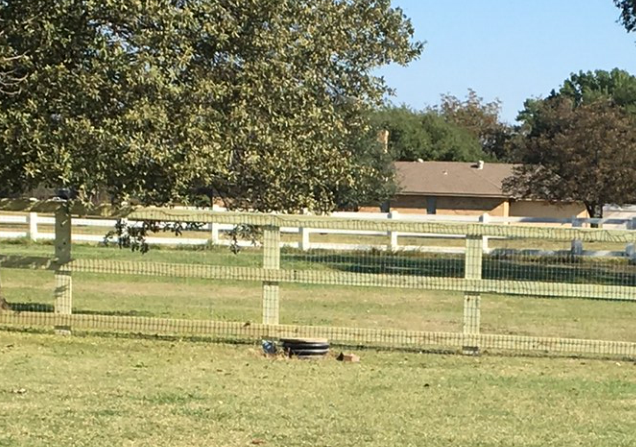 If Ellis County Texas is the place you call home, the team at Philip’s Fences are your local fencing professionals. Contact us for an estimate and get your fence installed during the off-season for “garden perfection” in the spring! Are you on the verge of succumbing to the Siren’s song of composite decking? Wait! Well-constructed western red cedar decks may just be the better option for you, particularly if you love to barbecue. Composite decking comes in hollow and solid boards. The former allows moisture to build up inside and warp. The latter also warp but do so less frequently. Cedar, on the other hand, maintains a natural wood density that is already nature trained to retain its shape during hot or wet weather patterns. Because the wood naturally contains thujaplicin compounds, it resists fungus and bacteria growths. Try standing on a slab of polyethylene after a hot day. The odds are good that your bare feet will not enjoy the experience. Cedar does not radiate back the day’s heat the way composite materials do. The wood feels good under your feet. 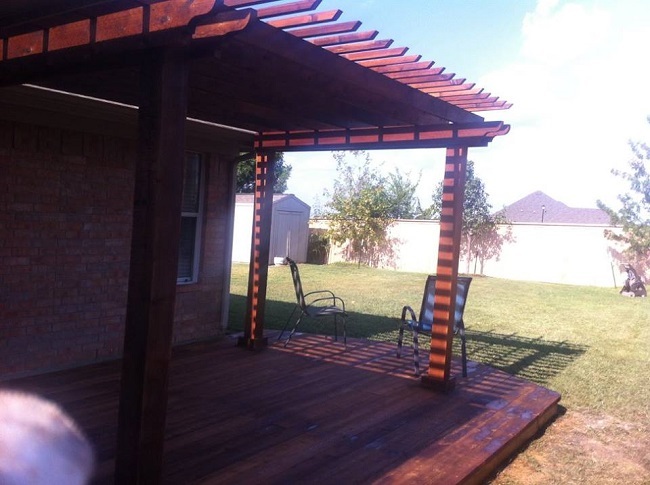 Once you select a stain color that perfectly matches your home, the cedar deck lets you spill an entire bottle of barbecue sauce without causing discoloration of the material. Hey, you might even drop some bits and pieces of steak for the dog that always seems to be around when you are grilling. Cleanup is a snap. This is not necessarily true with composite decking. Some oils and solvents react with the material and may cause stains. Changing the Look? No Problem! Decks are made to last you for a good, long time. Staining a cedar deck is easy. If you change the home’s color in a year, simply re-stain the deck to take on a shade that matches it. Not so with your composite decking; whatever color you selected will stick with it until the end of its useful life. Contact us today to learn more about adding decks to your home. With its simple construction and informal style, a split rail fence can add rustic charm to your property. Usually constructed of split cedar logs, this type of fence withstands weather and lasts for years. While it will not add privacy or keep small pets in the yard, split rail fencing offers a variety of benefits. If you need to mark property lines, why not do it in style? A longtime favorite of ranchers and pioneers split rail fencing will give your property a low maintenance, traditional look while marking boundaries. You can still enjoy the view or show off your landscaping with the open construction of a split rail fence. Are you looking for that extra dash of style for your yard? Split rail fencing adds curb appeal when used as an accent around a garden or small section within your property. Cedar posts and rails provide durable charm while maintaining a light and airy look. While a split rail fence won’t keep your small dog or cat in the yard, it can prevent larger animals from entering your property. As a longstanding fence of choice for ranchers, you can depend on split rail fencing to discourage deer from eating out of your garden and keep your horse or livestock inside your property. To sum up, a split rail fence adds charm and style while keeping maintenance to a minimum. If this type of fencing sounds like the right choice for you, contact us for information on split rail fence installation.